Use it as a decor or for storage, this vase will do both the duties flawlessly. Well made from ceramic, it will last for years. This vase is washed in green and has an amazing artwork done on it. The black hints make this vase with a lid useful. You can use it as a canister with the lid or like a vase without the lid. This vase will gain the needed attention from everyone visiting you. 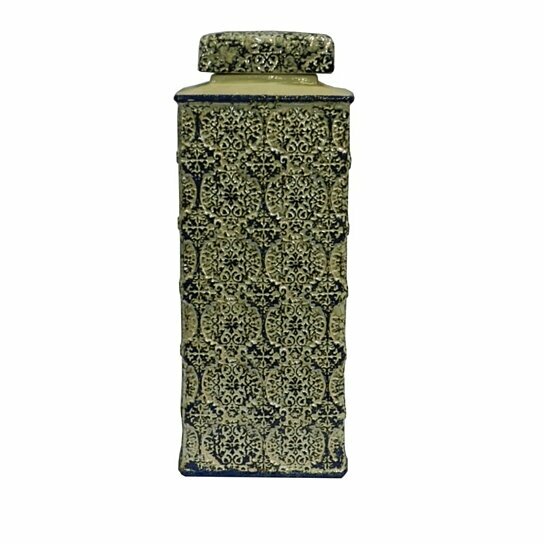 This canister vase can be kept on the windowsill or in one corner of your bathroom counter to impress every visitors of yours.